For my birthday this year I was utterly spoilt. It began with a lunch, ended with a dinner and then continued the next day with a box of goodies and a cake from Burch & Purchese. It was as if Willy Wonka had personally placed some sweets in a box and delivered them to me. Or perhaps it would have been similar to what Heston Blumenthal would have prepared if he had decided to create something slightly less bizarre and more in the form of real food. Either way, I tried a little bit of everything, took some photos and then got a sugar stomach ache. It was worth it. A fluffy white chocolate and raspberry mousse nestles inside this cake, which is just as impressive as the outside. Beneath the thick mousse are pretty pink layers, the bottom of which consists of a light muesli and honey nut sponge. Placed on top of this textural foundation is a layer of "exaggerated raspberry cream.” Raspberry and hibiscus jam is spread thickly between the layers, which are doused with honey-lychee syrup and crowned with freeze-dried raspberries. An oval of raspberry and lychee jelly is the 'cherry on top,' but just in case that's not fancy enough, the cake is completed with a white chocolate velvet spray. Usually such fancy desserts taste much better than they look. This time, that was far from the case. Rather than save the best for last, let me introduce my favourite treat first (aside from the cake, of course). Pardon me while I sexualise chocolate, but every bite of this rich, creamy block was utterly orgasmic. It is the most delicious chocolate I have ever encountered and while I wanted to share the rest of my birthday treats to spread the experience, I stingily broke off a single square for each family member to try. The sweetness of the white chocolate and the almost burnt taste of caramel makes this block my new addiction. The puffed quinoa stippled on the back is multipurpose: it adds a crunchy texture and enables you to convince yourself that it's a little bit healthy (not!). While you may have previously believed eating clay is difficult, your opinion will surely change after sampling this inventive treat. While B&P claim it’s a topping made for you to “pimp your pudding,” I can assure you it is just as delicious eaten straight from the bag. Made with edible kaolin clay (which can also be used in make up and pottery), fresh raspberries and white chocolate, I felt like a little kid who had been caught eating dirt—and enjoying it too. You've got to love the name of this biscuity dessert. I can just imagine a near-fatal hostage situation: the masked bandit has a gun to the head of the innocent housewife in the city bank. The sirens are blaring outside and the static of the police radio and speakerphone has the criminal on edge. He's not getting what he wants, when suddenly the rookie detective disobeys orders and walks straight into the bank. The bandit releases the gun's safety latch with a click but just before he shoots, the detective presents him with a tray of persuaders. He accepts, takes a bite, and the rest is history... oh sorry, did I veer off track? I was meant to describe the crumbly, shortbread texture of the biscuit base and how the white chocolate square on top, painted green, holds the persuader together. Then I was going to mention the crunchy pistachios and the slightest hint of lemon, but I'll save it for another time. Why chocolate dominoes? Why not! Although there were not quite enough to make a line and knock them all down, these premium quality chocolates still provided satisfaction. Consisting of a dark chocolate, a milk chocolate and two varieties of white chocolate bars, it was the perfect excuse to try each variety. Seeing as B&P pride themselves on creativity, perhaps they would be open to creating a domino line in store and filming it as it collapses in a predetermined 'B&P' trail for their blog? (You can hire me if you like, and pay me in treats). 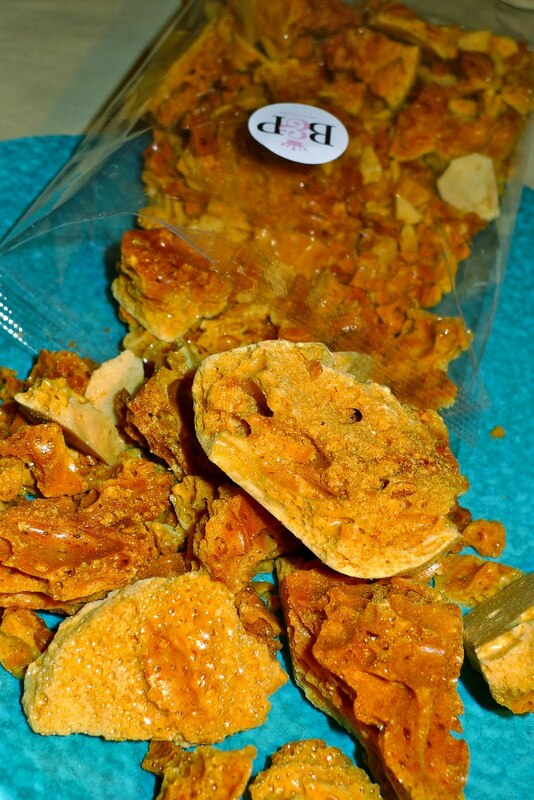 The handcrafted honeycomb at B&P is perfection. Unlike many manufactured varieties, this one tastes just like that spoonful of honey Mary Poppins always sings about. The reason for this can be traced to the honeycomb bee-ing made (ha!) in Melbourne, with honey crafted by local, urban bees. The airy, crunchy texture is addictive and when you take a bite, it dissolves on the tongue, releasing more flavour in an almost juicy explosion. These come in packets of three and are much easier to bite into than the real thing. The outer shell is made from fine Spanish dark chocolate and is so thin that it melts as you bite into it. Inside, oozing salted caramel waits to flow out and unavoidably stick to your chin as you are trying to eat it daintily. Dusted with a shiny gold lustre, these little beauties are certainly worth their weight. With chunks of fruity raspberries and pistachios, this bar of fudge is a decadent delight. 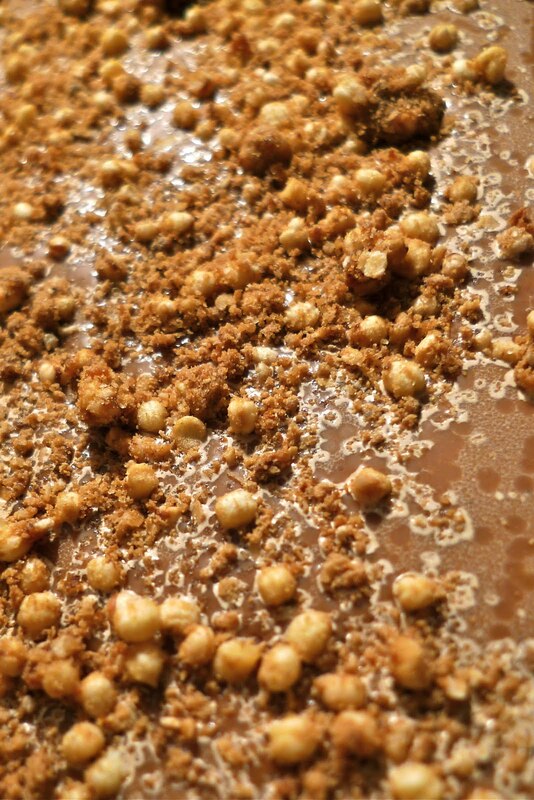 You can taste and see the effort that goes into creating these bars. You taste it when the mouth-watering, silky fudge melts in your mouth, and you can see it in the edible raspberry paint brushed on top. There is some food on earth I enjoy more than others. These include: chocolate, caramel, hazelnuts, mangoes and lobsters. Someone read my mind and invented a spread that combines all of my favourite things, with the exception of lobster because – let's face it – that would just be weird. Some people may even shudder a little at the thought of fruit invading a space usually reserved for more chocolate-friendly desserts. However, the spread tastes heavenly and consists of defined layers. Once you put a spoonful in your mouth (yes, I went straight for the spoon) the first flavour is rich chocolate, followed by a nutty, hazelnut undertone similar to Nutella. Next, the aroma of caramel kicks in and just when you think it's all over there's a sweet hit of fruity mango. Genius. Admittedly, my box of goodies is now empty, with the exception of a few honeycomb crumbs and three quarters of a jar of spread (both of which I plan on mixing with ice cream as soon as I've completed this post). After hearing so much about, and tasting evidence of, B&P's kitchen of creativity, it was time for me to pop in and pick out some of their immaculately crafted desserts myself and watch the master pâtissiers in action. Stay tuned for a post on location at B&P in the next week or two. 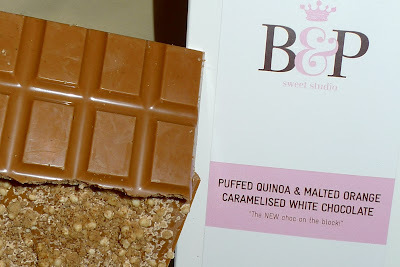 Thanks for doing this blog , i always follow B&P blog for ideas and inspiration, as pastry chef my self, living in the Gold Coast i have not had a chance to get down to melbourne yet , but my first stop will B&P, i love your blog keep it up. Thanks Gary! Your kind words are much appreciated. Funnily enough I'm at Melbourne airport about to jump on a plane to the Gold Coast! Where do you work?